You may not be able to prevent dental emergencies from happening, but it never hurts to keep the Boy Scout motto in mind and always be prepared. If you’re a patient at Dentistry by Design, we invite you to contact our team right away in case of dental emergency. We’re here to help whenever patients need us, and we offer same day emergency dentistry appointments whenever possible. If we’re unable to see patients right away, we’ll be happy to walk them through at-home first aid and pain management tips over the phone. 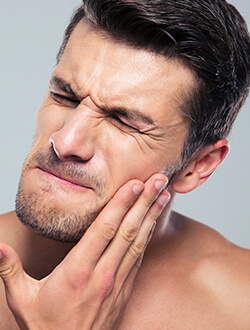 If you experience severe facial trauma, potentially broken jaw, or soft tissue laceration that does not stop bleeding within an hour, we encourage you to proceed to your nearest emergency room as these concerns may be life threatening. Dr. Martin will be happy to work with you to repair any dental damage in partnership with other emergency medical professionals. While patients may not be able to plan for a dental emergency, adjusting some habits may help prevent them. We encourage patients to wear athletic mouthguards when engaging in sporting events, avoid chewing on hard objects like ice or fingernails, and refrain from using teeth as tools to open packages.